From an ecological point of view, the most important constituent determining ocean color is chlorophyll a, which is primarily responsible for marine photosynthesis and consequently for primary productivity. Chlorophyll a in open sea is almost entirely contained in phytoplankton, microscopic algal particles suspended in surface waters. This is the reason why the data about the color of the water reaching the satellite allow us to compute, by specific algorithms, chlorophyll surface concentration and therefore to get information about phytoplankton. The maps reported here show values of Chlorophyll a - 8-day average - computed from Level 2 data obtained from the MODIS sensor (Moderate Resolution Imaging Spectroradiometer) onboard Aqua satellite, and are distributed by NASA. 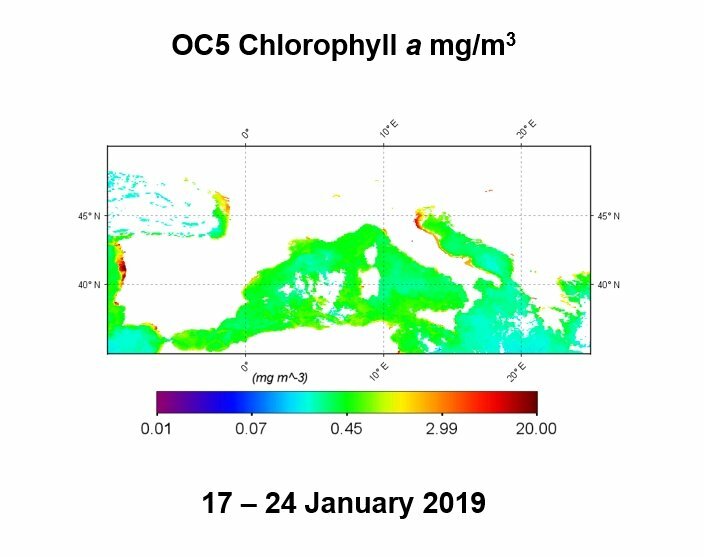 The OC5 algorithm, for Case 1 and Case 2 waters, although based on a dataset located in the Bay of Biscay and the English Channel, and only on a few data from the Mediterranean sea, performs well in our area of interest (Ligurian and North Tyrrhenian Sea). The SAM_LT algorithm , for Case 2 waters and in course of implementation for Case 1 waters, is calibrated on the Ligurian and North Tyrrhenian Sea. The SAM_LT algorithm gives good results in the area taken into consideration - see monthly average map.